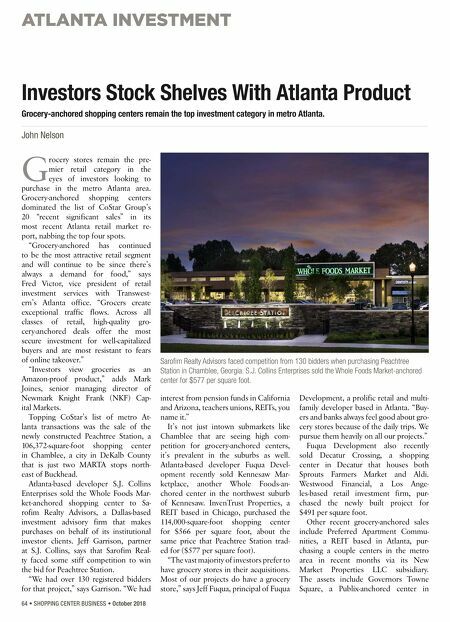 ATLANTA INVESTMENT October 2018 • SHOPPING CENTER BUSINESS • 65 the Cobb County city of Acworth, and Mountain Crossing, a Kroger-an- chored center in Gwinnett County's Dacula. Also in Acworth, Collett Cap- ital purchased Cherokee Commons, a Kroger-anchored center, from PMAT Cos. The high demand for grocery-an- chored centers has kept cap rates sta- ble despite interest rates ticking up. Victor says that similar to investors, lenders also view grocery acquisitions favorably compared to other segments of retail real estate. "All sectors of the lending market — life insurance companies, CMBS, banks — would be willing to finance a grocery-anchored deal," says Victor. "It's the most attractive and secure re- tail investment. Those are the types of deals that enjoy extremely competitive financing." OPERATIONS DRIVE PRICING Beyond its repeat traffic and rela- tive insulation from e-commerce, the grocery sector is attractive to investors because of its track record of strong sales. Shopping center owners and grocers alike are increasingly focusing on improving performance metrics in order to generate maximum revenue. "Site-level performance is very import- ant to investors," says Joey Odom, region- al director of Stan Johnson Co.'s Atlanta office. "Grocery is trading well, but even in grocery there are the haves and the have nots. For investors, sales per square foot is more important now than ever. Opera- tions are viewed much more shrewdly in terms of efficiency." Kroger, Publix and Amazon, which owns Whole Foods, are reinvesting in their stores in order to boost sales. Gro- cers are embracing online ordering, deliv- ery, prepared meal kits, cosmetic updates to stores and refreshing inventory and displays. Nationwide, Kroger plans to only open 20 to 25 stores over the next three to five years across its portfolio of brands. This is a significant pull- back from the past when the grocer would open hundreds of stores a year. "For grocers, it's more important to be efficient at existing stores than open new ones," says Odom. For all of retail real estate, including grocery, CoStar reports that total retail sales per square foot of occupied space is at $335, up 35 percent compared to the lowest point of the recession in 2009. This improved metric is one of the key rea- sons why pricing for retail assets is up 50 percent since 2010. Back in April, Charlotte-based Asa- na Partners acquired Krog Street Mar- ket, a popular food hall in the Inman Park neighborhood located adjacent to the Atlanta BeltLine's Eastside Trail. Atlanta-based Paces Properties sold the asset to Asana for $751 per square foot, by far the highest price per square foot of any retail invest- ment sale on CoStar's top 20 sales list for the past 12 months. IS THERE A BID-ASK SPREAD? Investment sales brokers are split on whether or not the Atlanta retail market is currently experiencing a bid- ask spread, where the asking price put forth by sellers exceeds the highest price buyers are willing to bid. The result of a bid-ask spread is a stall on investment sales activity. Victor of Transwestern says that there currently is a bid-ask spread stemming from sellers looking at valuations that don't reflect the same pricing those same assets commanded a few months ago. "Some owners have been able to adapt to market pricing, while others have been reluctant to adjust their pricing," says Vic- tor. "It's difficult when you have a REIT that answers to Wall Street and there's a valuation with a certain spread, but pric- ing is coming in at the lower end or below the spread." In addition to sellers looking at yesterday's pricing, a changing buyer pool may be partially to blame for a bid-ask spread. In the net lease world, Odom of Stan Johnson Co. says that there's been a "dramatic shift" in terms of the companies in the buyer pool, with new entrants — mostly pri- vate equity investors — now making up the bulk of the market share for new acquisitions. Odom also says that the amount of net lease retail product on the market has more than doubled over the past 18 months, which indicates buyers and sellers aren't quite on the same page. "Those deals are still sellable if priced appropriately," says Odom. "Appropriately priced deals, even if they have some complexity, are trad- ing at a pretty fluid rate." 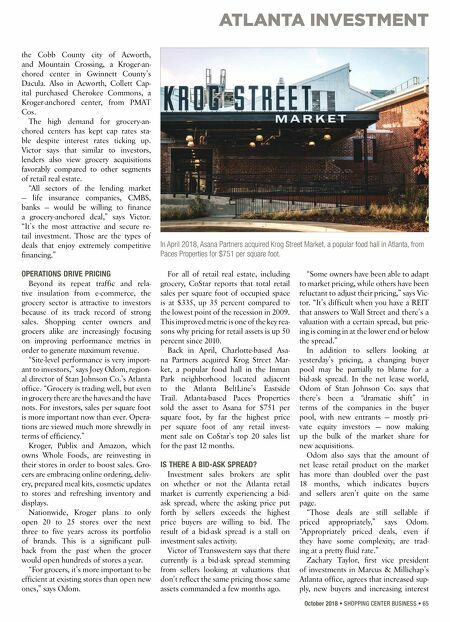 Zachary Taylor, first vice president of investments in Marcus & Millichap's Atlanta office, agrees that increased sup- ply, new buyers and increasing interest In April 2018, Asana Partners acquired Krog Street Market, a popular food hall in Atlanta, from Paces Properties for $751 per square foot.